Each of these natural Bloodstone rune stones bears one of the twenty four traditional symbols of the Elder Futhark runic alphabet except for a single stone that has been left blank. Crafted from natural stone and accented with gold these divination crystals may vary in color and are approximately 1/2 inch to 1 inch in diameter. 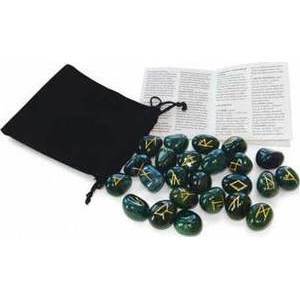 Each rune set contains 25 Bloodstone crystals with a black velvet bag for storage and an instruction booklet. Comes in a box for gift giving ease.